May 30, 1992, A. & L. G. Crabo. Spaelotis bicava is the most commonly collected Spaelotis in most parts of the Pacific Northwest. 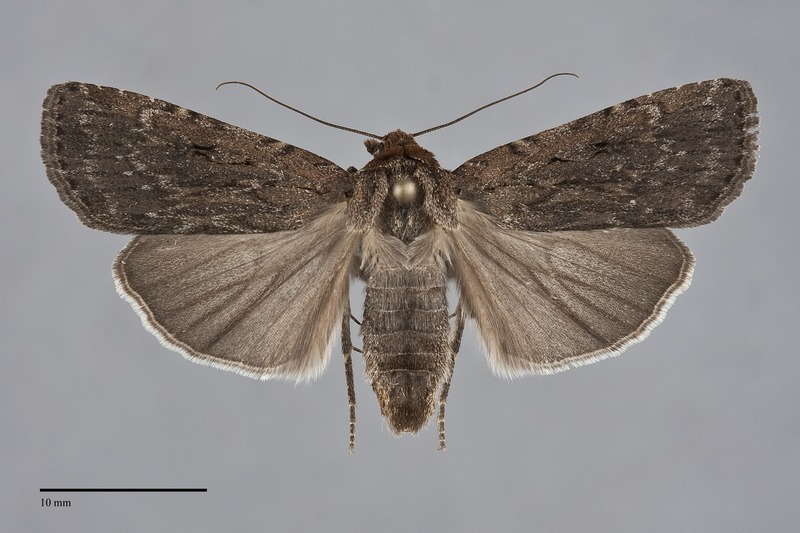 It is a medium sized moth (FW length 16–20 mm) with a streaky gray-brown forewing and dark gray hindwing. It is one of four of our five Spaelotis species that have an almost identical superficial appearance. The forewing is elongate and gray-brown in color, sometimes with a slight orange tint to the costa. A thin black basal dash can be short or extend to the antemedial line. The lines are slightly darker than the ground color and filled with lighter brown or gray-brown. The antemedial line is jagged, especially near the trailing margin. The postmedial line is also uneven. It is drawn abruptly drawn toward the base at the costa, is laterally convex from the superior cell to the fold, and then nearly straight to the trailing margin which it meets at a right angle. The pale subterminal line is variable, often absent or incomplete. The orbicular spot is black, oval, and touches the reniform spot in some specimens or is joined to it by a thin black line. It is filled with the ground color, slightly lighter brown, or light gray-brown. The reniform spot is usually incomplete, usually with a segment of the black medial portion present, and is filled with the ground color or slightly lighter brown. The hindwing is dark brown-gray with slightly darker veins and discal spot and a two-toned fringe, dark basally and white distally. The head and thorax match the forewing ground color. The male antenna is filiform. Spaelotis bicava is most likely to be confused with Spaelotis clandestina in the Northwest because it is the only other Spaelotis species in much of its range. This species is the least similar to it of four other Spaelotis species in our region. 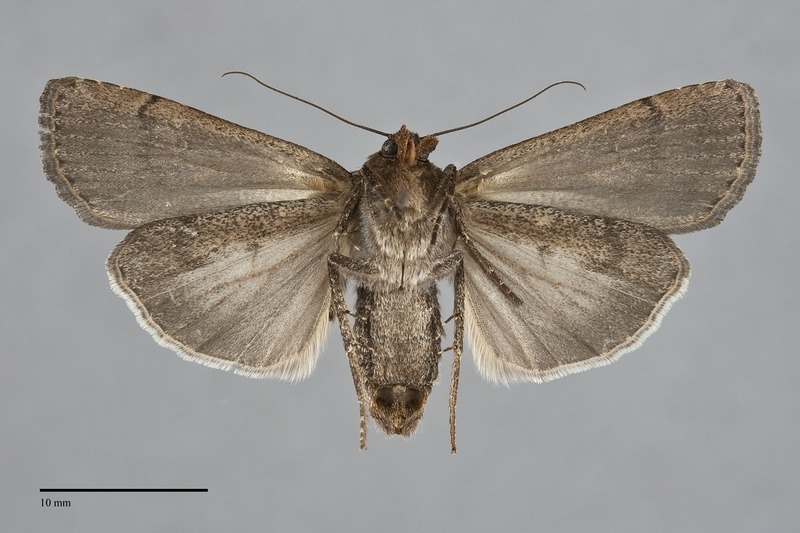 It is darker and smoother brown with light hindwings and reduced forewing markings. 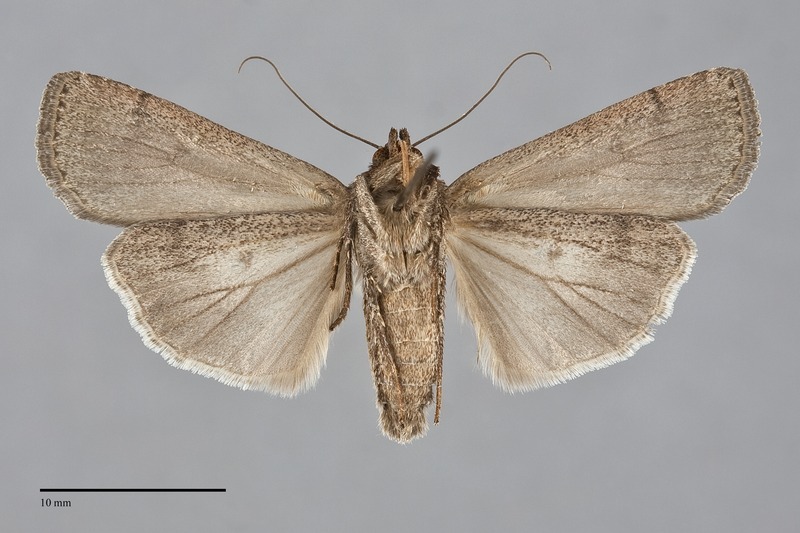 Three streaky Spaelotis species that occur in southern Oregon and Idaho are nearly identical to S. bicava except that none of the three have a form with an orange tint on the forewing. All Spaelotis females are best identified by the size, shape, and position of a set of shallow pits on the posterior ventral abdomen which lose their covering of loose scales after mating. Spaelotis bicava has two large shallow triangular pits that are situated next to each other near the tip of the abdomen that are easily observed with the naked eye. Spaelotis males are best identified by association with the females, but can also be distinguished by dissection. This species is widely distributed in dry forests, grasslands, and rangelands throughout much of western North America. In the Pacific Northwest, it is common to abundant in dry, open ponderosa pine forests, juniper woodlands, and on sagebrush steppe at middle to low elevations east of the Cascades. It frequently builds up into massive epidemic outbreaks on more disturbed rangelands. It also occurs in dry, open grasslands at low elevations west of the Cascades, and in meadows and spruce-fir forests at high elevations along the summit of the Cascades. 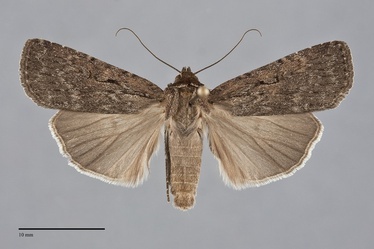 Spaelotis bicava is widespread in the Pacific Northwest east of the summit of the Coast and Cascade Mountains, occurring as far north as south-central British Columbia. There is a single record of this moth from northwestern British Columbia in the moths of North America fascicle (Lafontaine 1998). This is the second most widespread member of the genus after S. clandestina. Spaelotis bicava is found in most of the western United States and adjacent southern Canada. The eastern limit of its distribution is eastern Colorado, western Kansas and Nebraska, and southwestern Saskatchewan. This species is a climbing cutworm, and appears to be a generalist feeding on both hardwood shrubs and herbaceous vegetation. During epidemic outbreaks, larvae are particularly abundant feeding on big sagebrush (Artemisia tridentata) in the Asteraceae. During epidemic outbreaks, this species might help to deplete forage for domestic livestock on heavily over-grazed rangelands.